Pierre-Luc Dubois, Artemi Panarin and Josh Anderson also scored for the Blue Jackets, who dealt the Avs their first loss. Alexander Wennberg had the primary assists on both of Foligno’s goals. “I’m happy we had to go through some stuff and found a way to win,” Tortorella said. Foligno got his first goal of the season 6:49 into the game when he took a pass from Wennberg from behind the line and found the net with a back-hander from the slot. Dubois got what he called “a pretty easy goal” halfway through the period, going off Grubauer’s glove with a rebound while Columbus had a 5-on-3 advantage. NOTES: Riley Nash centered the third line for the Blue Jackets after Brandon Dubinsky suffered a strained oblique muscle in practice Sunday and was put on injured reserve. 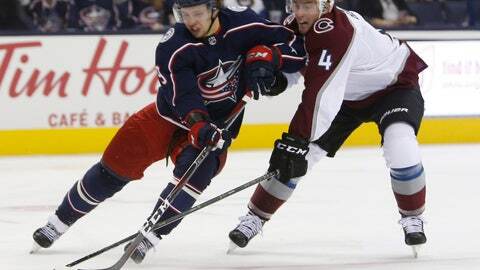 … Former Blue Jackets F Matt Calvert and D Ian Cole returned to Nationwide Arena for the first time since signing free-agent contracts with Colorado last summer. Calvert, who played eight seasons in Columbus, got a standing ovation during a video tribute. … Colorado’s Gabriel Landeskog was in the lineup after missing practice Monday with a lower-body injury. … Lukas Sedlak made his season debut after being a healthy scratch in the first two games. … D Scott Harrington played his first game of the season after being out with a concussion.